Anterior view of the left shoulder and acromioclavicular joints, and proper scapular ligaments. The glenohumeral (GH) joint is a true synovial ball-and-socket style diarthroidal joint that is responsible for connecting the upper extremity to the trunk. It is one of four joints that comprise the shoulder complex. This joint is formed from the combination of the humeral head and the glenoid fossa of the scapula. This joint is considered to be the most mobile and least stable joint in the body, and is the most commonly dislocated diarthoidal joint . Elevation of the humerus on the glenoid in the frontal (coronal) plane. Forward and upward movement of the humerus on the glenoid in the sagittal plane. Upward movemement of the humerus on the glenoid in the sagittal plane towards the rear of the body. Rotation of the humerus on the glenoid in a medial direction. Rotation of the humerus on the glenoid in a lateral direction. Elevation of the humerus on the glenoid in the scapular plane, which is midway between the coronal and sagittal planes. Movement of the humerus on the glenoid in a medial direction, usually accompanied with some degree of shoulder flexion. Together, the Joint Capsule and the Ligaments of the GH Joint work to provide a passive restraint to keep the humeral head in contact with the Glenoid Fossa. 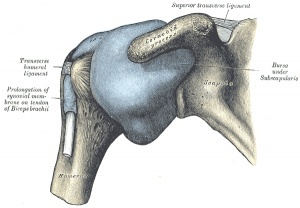 Anterior view of the capsule of the right glenohumeral joint (distended). The lateral attachment of the GH Joint capsule attaches to the anatomical neck of the humerus. The medial attachment of the joint capsule is the glenoid and the labrum. According to some sources, the the overall strength of the capsule bears an inverse relationship to the patient's age; the older the patient, the weaker the Joint Capsule . With the arm in a resting position the inferior and anterior portions of the capsule are lax, while the superior portion is taut. The anterior portion of the capsule is reinforced by the superior, middle, and inferior glenohumeral ligaments which form a Z-shaped pattern on the capsule. The muscles of the rotator cuff act to reinforce the joint capsule superiorly, posteriorly, and anteriorly. The joint capsule provides little support to the GH joint without the reinforcement of ligaments and the surrounding musculature . Limits external rotation and inferior translation of the humeral head. Arises from the glenoid and inserts on the anatomical neck of the humerus. Limits external rotation and anterior translation of the humeral head. Limits internal rotation and anterior translation (posterior portion). Arises from the glenoid and inserts on the humerus just beyond the lesser tuberosity. Split into anterior and posterior divisions by the biceps tendon. Anterior portion limits extension while the posterior portion limits flexion. Both divisions limit inferior and posterior translation of the humeral head. Helps to support the weight of the resting arm against gravity. Runs laterally from the coracoid process to the humerus, covering the superior Glenohumeral Ligament and blending with the Superior Joint Capusle and Supraspinatus Tendon superiorly. This ligament serves to keep the tendon of the long head of the biceps in the bicipital groove. The closed packed position of the GH Joint is Abduction and External Rotation. The open packed position of the GH Joint is around 50 degrees of Abduction with slight Horizontal Adduction and External Rotation. However, the point of maximal capsular laxity has been found to be 39 degrees of Abduction in the Scapular Plane, which suggests that the open packed position may be close to neutral position of the shoulder. Capsular pattern of the GH joint is characterized by external rotation being the most limited, followed by abduction, internal rotation, and flexion. The labrum serves to deepen the glenoid fossa by around 50%, allowing for more contact area between the surface of glenoid and the humeral head. The increase in contact area also enhances joint stability. Common pathologies of the labrum include SLAP lesions and Bankart lesions. Multiple bursae are distributed thoughout the shoulder complex, however, the subacromial bursa is one of the largest bursae in the body. The subacromial bursa is composed of the subdeltoid and subacromial bursa because they are often continuous. This bursa serves to allow the rotator cuff to slide easily beneath the deltoid muscle. Common problems may include shoulder bursitis. ↑ 2.0 2.1 2.2 2.3 2.4 2.5 2.6 2.7 Dutton M. Dutton's Orthopaedic Examination Evaluation and Intervention. McGraw Hill Professional; 2012 Apr 13. ↑ 3.0 3.1 3.2 3.3 3.4 3.5 Levangie PK, Norkin CC. Joint Structure and Function: A Comprehensive Analysis. FA Davis; 2011 Mar 9. ↑ Hsu AT, Chang JH, Chang CH. Determining the Resting Position of the Glenohumeral Joint: A Cadaver Study. Journal of Orthopaedic & Sports Physical Therapy. 2002 Dec;32(12):605-12.